Materials — Yes, They Matter… A Lot! Normally when people talk about a roofing project, they are thinking about replacing the surface. As traditional composition shingles are the most popular surface material, the consideration is routinely when will the next layer be added, or is it time to strip them off and add a fresh layer. In this guide, we’ll go through all the popular options for outer layer (or surface) materials. Our aim for each option is to convey the cost, life span, types of roofs (or slopes) it is suitable for and any other notes to consider. Slate tiles – Is it any surprise that the most durable material is also the most expensive? Perhaps it will be when you see how the entire list of options sorts itself out. Slate has been a choice for many centuries, often signifying wealth of the home owner. The main drawback of slate is that its cost for both materials and labor can cost as much as a new home. Yeah, it’s that expensive. Application costs around $17,000 to $85,000. Why is there such a huge range? Because slate isn’t readily available everywhere, and requires special expertise to install it. If slate roofs are very common to your area, then the cost is likely to be lower, more competitive among contractors. There is also a synthetic slate option that has similar appearance and costs substantially less (around $11,000 to $20,000), but the lifespan is akin to concrete tiles, or good but not the best. 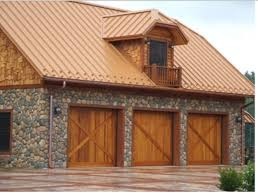 Metal Roofing – is the most light-weight option of all choices. And yet, it is highly durable. Metal is an ideal insulator due to its durability, and because metal naturally reflects heat, rather than passing it onto the roof sheathing and the attic space below it. Commonly, there are two main options of metal for residential roofs; standing seam panels (the norm) and metal shingles. The cost largely depends on the profile and type of metal. Steel and Aluminum are the popular options, while Copper is the most distinguishable choice. Steel is the most durable and yet the least expensive, ranging from $5,000 (for low-end G-60 corrugated steel panels with exposed fasteners) to $22,000 – $35,000 for standing seam to install. Aluminum is a choice for its flexibility, and costs $15,000 to $30,000 for aluminum shingles to install. Aluminum standing seam would cost in the range of $23,000 – $37,000 for a comparable roof. With Copper, the gold-like finish is coveted by many, but it can fade to a green, which can also be desirable in some cases, unless regularly maintained. For Copper installation, plan to spend $20,000 to $30,000 for the materials alone. Total cost installed, can easily top $50,000 on an average roof. Color options are varied as shown in the pictures. Yet, paint applied to the surface is likely to fade or chip long before the lifespan of the material. Lower pitched roofs as well as very steep roofs can handle metal roofing. Metal holds up incredibly well against the common weather elements, plus it is fire resistant. The disadvantages of metal roofing are a possible noise factor, but only if there is no attic space in a home. Some denting may also be possible with lower-end products. If you happen to live in a house with no solid sheathing and no attic space, then you either enjoy or get used to the sound of rain on a metal roof or it grates on you like a drummer living upstairs. If rain is heavy or hailstones are falling, a softer metal (like aluminum) may dent. Not that it occurs regularly, but over 50+ years, metal roofing can show dents, while asphalt will crack and fail outright, and whereas stone or wood will not. Concrete tiles – nearly match metal on the durability scale, but have a few more drawbacks. Cement is a very heavy material, hence it needs stronger support in the framing. It generally requires a special skill to apply and to navigate the roof structure. Why? Because it is more prone to breaking. Simply walking on it, may cause tiles to break. And it costs more than copper to install, or around $20,000 to $35,000. But it is a less expensive option compared to slate and appears fairly similar. Its appearance can vary (as pictured above), so put away notions that it is only the drab gray color that’s available. Plus it can be shaped to resemble other materials like wood or ceramic tiles. Color can be mixed throughout the concrete or applied to the surface. Cement tiles work better on steeper slopes, but moderate slopes can handle it fine, as well. Besides it’s brittle nature, another drawback is the underlayment (think sheathing material above the wood). It will not last anywhere near as long as the concrete itself. Every 8 to 20 years, the tiles need to be removed (temporarily) while a contractor re-applies a new underlayment. Not doing this can cause significant issues with the wood base and lead to less of a lifespan for the tiles. Clay (or Ceramic) tiles – are one of the older materials that are still popular in many parts of the world. Prior to wood shakes, this was the default material for covering a home dwelling for most people. Clay tiles last as long as concrete, but like cement, it is brittle or prone to breaks. A contractor with experience is best for its installation. Though once applied, it requires less maintenance and there’s no need to redo sheathing during the lifespan of the tiles. Cost is the 2nd highest on this list, but still far less expensive than slate. Clay tile installation is $28,000 to $45,000. While Spanish Red is the popular color, like cement, it now has the option to mix various hues to achieve most color options and even can change shape. Moderate to steep slopes can handle ceramic tiles, but like the other heavy materials it needs a stronger framing apparatus. Wood (or Cedar) Shakes – are a fairly popular choice, especially where timber is plentiful. Prior to the 20th century, it was the most popular choice in many places for a good 200 years or so. At this point of our list, the lifespan goes down significantly, as does cost. And as you can guess, durability is decreased. Wood is also surprisingly heavy, well, heavier than metal, but not as bad as say slate or concrete. Most standard frames can handle a wood roof. The cost to install it varies as modern roofers may not have the traditional skills for proper installation (although many do). A fair price range is $12,000 to $28,000 for an average cedar wood roof installed. For some home owners, the natural look of wood is hard to pass up. Most prefer the natural color of wood, which starts off a lighter, blond color and fades to silver-gray. But of course, wood can be painted, although the paint may fade over time. Low to steep slopes handle wood roofing fine. Cedar shake holds up in wind fairly well, but is very poor with regards to flames. Fire retardants can help, but wood must be regularly treated. And wood is especially susceptible to mold or rot, which means checks and maintenance must be done no less than every 3 years, or more often in wetter climates. Asphalt Shingles – The least durable option happens to also be the most popular choice, with the low cost being the main reason why. Every roofer and many carpenters can install it, and do so quickly. It’s easy to walk on, and won’t break. When a pro installs it, the cost is normally $7,500 to $15,000 for a simple roof. There are proper installation guidelines that will increase its lifespan and make repair less likely. Did you know? Most mid-range Asphalt shingle Roofs will last 15 to 20 years. 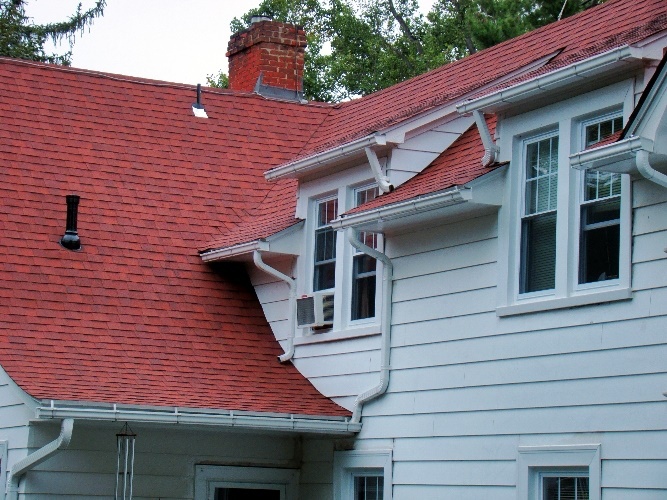 In the modern era, asphalt shingles come in a wide array of colors. The shingles are only moderately heavy, and so all frame types ought to support it just fine, with all low to steep slopes having no problem holding it. Most shingles are OK in terms of fire resistance, but questionable in terms of wind resistance, unless applied by a professional. Very strong winds are more likely to test even the best pro’s ability to make sure they stay where they were applied. While the low cost is an obvious pro for many, the lack of depth and dull finish compared to other options tends to be viewed as ‘cheap’ or too simplistic. Previous Previous post: Top 11 Smart Home Improvements, Plus Costs & ROI 2017 Update!